Rome. Click here to play! Greatest Empire in the world. Rome. Home of civilization and culture. Rome. Your home or your final resting place. It all depends on whether you can survive and earn a Gladiator's Gold horde. It isn't an easy life, being a gladiator. That's why the pay is so good when you aren't a slave. Any injury, even the most minor, could do you in if infection takes hold. Don't even think about wearing armor - the crowd likes blood, you see? Yes, Rome likes to act restrained and stoic, but it has a rare bloodlust that won't be satisfied by a sword clattering on scale armor. I hope you were born under some lucky stars, gladiator, as it's too easy to meet a messy end while on the path to a fortune when fighting in the arena. The Gladiator's Gold slots take you back to the brutish times of the Ancient Roman gladiatorial games, where slaves, nobles and fearsome animals fought for the entertainment of the crowds. 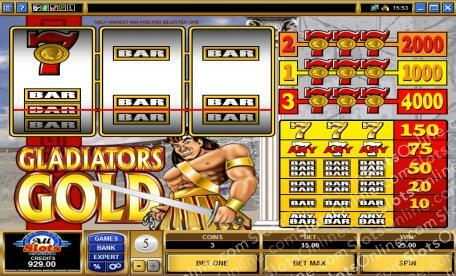 A 3-reel classic slots game with 3 paylines and bets to appeal to high rollers, the Gladiator's Gold slot machine will make you feel like a champion if you win. Enter the Coliseum and fight for your fortune today!